My husband and I traveled to South Africa in October. Throughout our trip we experienced exceptional game viewing, scenic tours and beautiful accommodations. Our trip was full of highlights: We were lucky to see the Magnificent Seven in one three-hour game drive (the Big Five plus cheetah and wild dog). We cruised along the beautiful Atlantic coastline on our way to Cape Point, then watched the penguins at Boulders Beach in Simonstown. 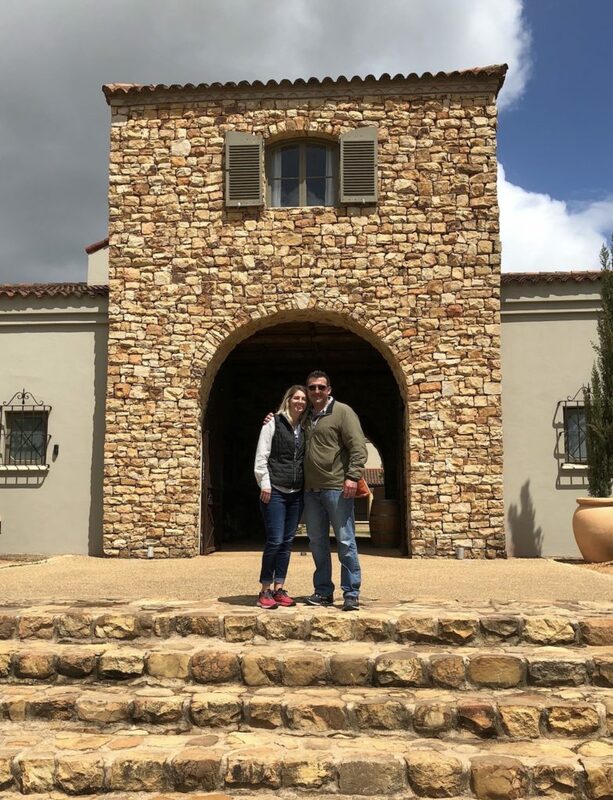 Our last few days in South Africa took us to the Cape Winelands to soak in the beautiful scenery and enjoy some wine tastings in the region. Our drive from Cape Town to the Winelands was beautiful, and as we reached La Residence, we found ourselves in a valley surrounded by mountains—a great backdrop for stunning pictures. 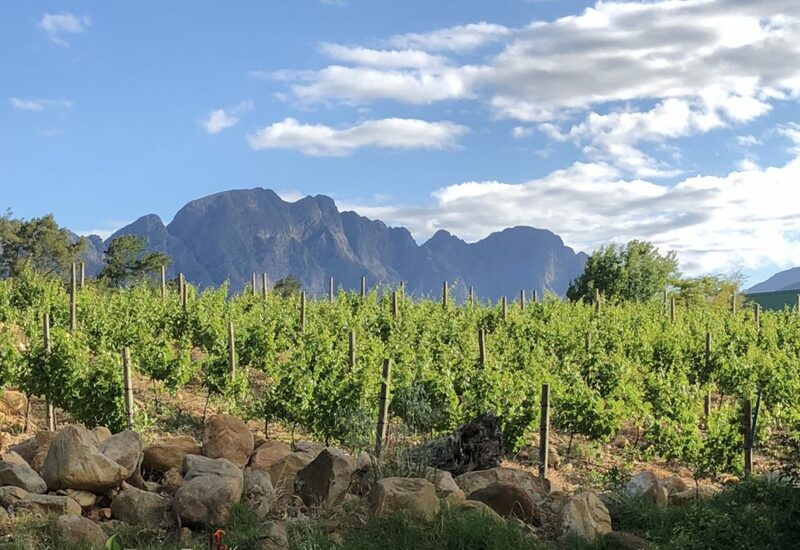 Before this trip, I had no idea how much wine South Africa produces, but after a short time with our private guide, I learned a lot about the history of wine in South Africa. The country has three main areas known for their wines: Paarl, Stellenbosch and Franschhoek. 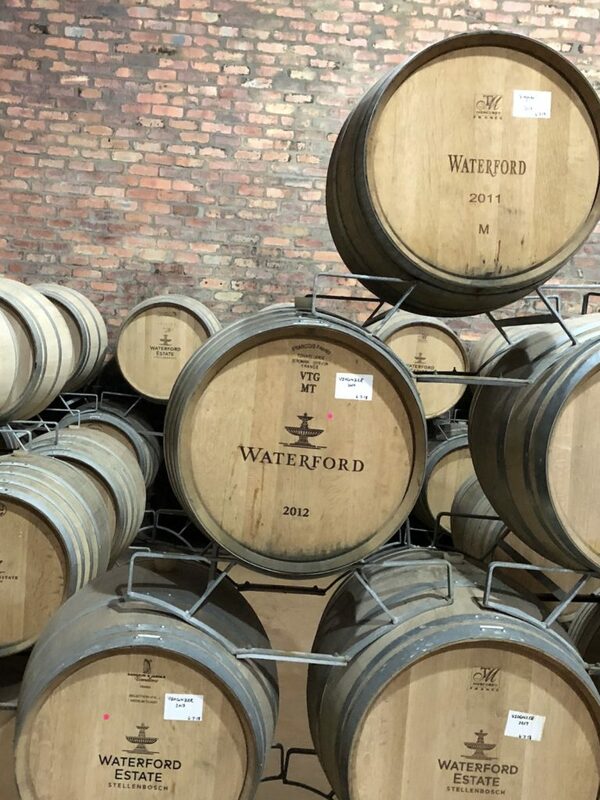 We had tried some great South African wines on safari and in Cape Town, so we had requested one of our stops to be Waterford, located in Stellenbosch. The other two stops along the way were chosen by our guide, and all three of the wineries we visited offered a unique experience. Our first stop was at Fairview, a working farm located in Paarl. A unique welcoming committee of goats, on their tower, greeted us as we approached the entrance of the tasting room. Here, the wine tasting is more of a social occasion, with four bars setup with a host assisting each group. Fairview pairs their wine with their homemade cheese varieties. In addition to purchasing wine, guests here can also buy a variety of homemade items, including cheese, jams, bread and olive oil. With its social atmosphere and cheese pairings, Fairview was a great first stop on our tour. Our next stop was Kanonkop in Stellenbosch. The tasting room was much quieter, and we had our own host who took the time to explain each wine to us, the awards they’d won and the wine-making process specific to each one. While I am not a wine expert, I believe that if you are a red wine fan, this may be your stop. Kanonkop offers a variety of red wines, including pinotage, which is South Africa’s signature red wine grape and a cross between the pinot noir grape and hermitage grape. Our last stop was Waterford. A perfect tree-lined drive provides a warm welcome onto the estate. After climbing the steps of the Mediterranean-style estate, we had a choice to sit outside in an open-air courtyard or indoors at a choice of tables, sofas and chairs. We chose a table and sofa beside the fireplace, and the crackle of the fireplace added to the warm experience. Waterford is known for their wine and chocolate pairings. Yes, wine AND chocolate. Each chocolate is paired with a specific Waterford wine, and the pairings provided us with a good sense of the Waterford collection of wines. We followed up our wine tasting with a cellar tour, which our tour guide had requested for us. It was an interesting and informative look into creating the wines of Waterford and helped make the estate my favorite of the three. South Africa proved to be a country of many experiences, and our stay in the winelands was the perfect ending to an already incredible trip.